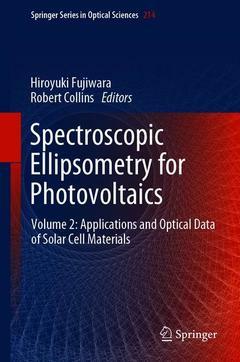 Coordinators: Fujiwara Hiroyuki, Collins Robert W.
Spectroscopic ellipsometry has been applied to a wide variety of material and device characterizations in solar cell research fields. In particular, device performance analyses using exact optical constants of component layers and direct analyses of complex solar cell structures are unique features of advanced ellipsometry methods. This second volume of Spectroscopic Ellipsometry for Photovoltaics presents various applications of the ellipsometry technique for device analyses, including optical/recombination loss analyses, real-time control and on-line monitoring of solar cell structures, and large-area structural mapping. Furthermore, this book describes the optical constants of 148 solar cell component layers, covering a broad range of materials from semiconductor light absorbers (inorganic, organic and hybrid perovskite semiconductors) to transparent conductive oxides and metals. The tabulated and completely parameterized optical constants described in this book are the most current resource that is vital for device simulations and solar cell structural analyses. Introduction.- Part I: Application of Ellipsometry Technique.- Analysis of Optical and Recombination Losses in Solar Cells.- Optical Simulation of External Quantum Efficiency Spectra.- Characterization of Textured Structures.- On-line Monitoring of Photovoltaics Production.- Real Time Measurement, Monitoring, and Control of CuIn1‑xGaxSe2 by Spectroscopic Ellipsometry.- Real Time and Mapping Spectroscopic Ellipsometry of Hydrogenated Amorphous and Nanocrystalline Si Solar Cells.- Part II: Optical Data of Solar-Cell Component Materials.- Inorganic Semiconductors and Passivation Layers.- Organic Semiconductors.- Organic-Inorganic Hybrid Perovskites.- Transparent Conductive Oxides.- Metals.- Substrates and Coating Layers. Hiroyuki Fujiwara received the Ph.D. degree from Tokyo Institute of Technology. He was a research associate at The Pennsylvania State University. In 1998, he joined Electrotechnical laboratory, Ministry of International Trade and Industry, Japan. Later in 2007, he became a team leader of Research Center for Photovoltaics, National Institute of Advanced Industrial Science and Technology (AIST) in Japan. He is currently a professor in the Department of Electrical, Electronic and Computer Engineering, Gifu University. Robert W. Collins received the Ph.D. degree from Harvard University. He worked at BP America/Standard Oil Co. In 1992, he became a professor of Physics and Materials Research at The Pennsylvania State University. He is currently a Distinguished University Professor and NEG Endowed Chair of Silicate and Materials Science with the Department of Physics and Astronomy, University of Toledo. He co-directs the Center for Photovoltaics Innovation and Commercialization.